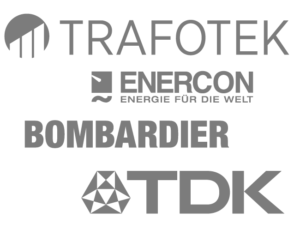 World’s most important companies use Solfas Test Software to test their products. 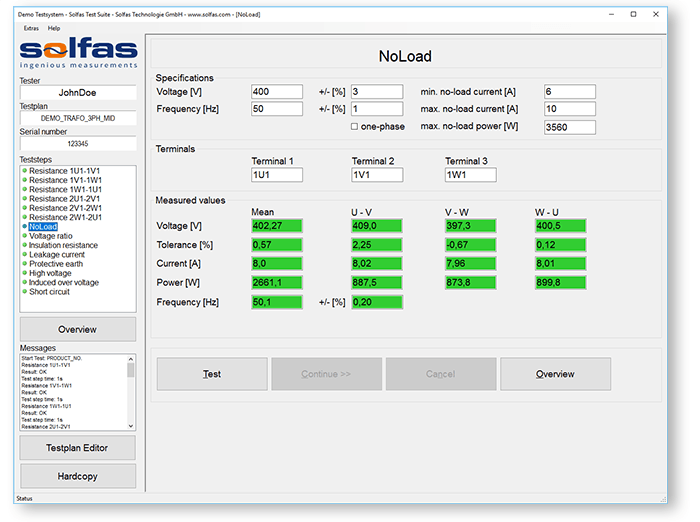 Solfas Test Software Suite is designed to handle enormous numbers of test objects. 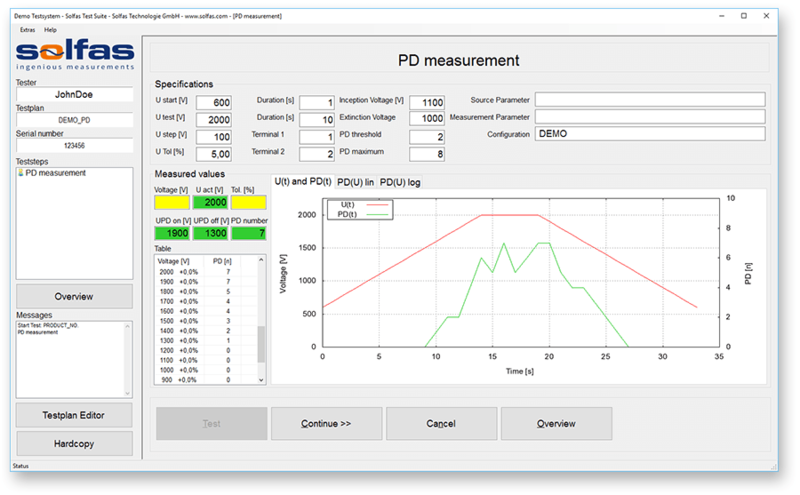 Take advantage of modern technologies to speed up the test and measurement process and create portable machine and human readable data for your quality management needs. 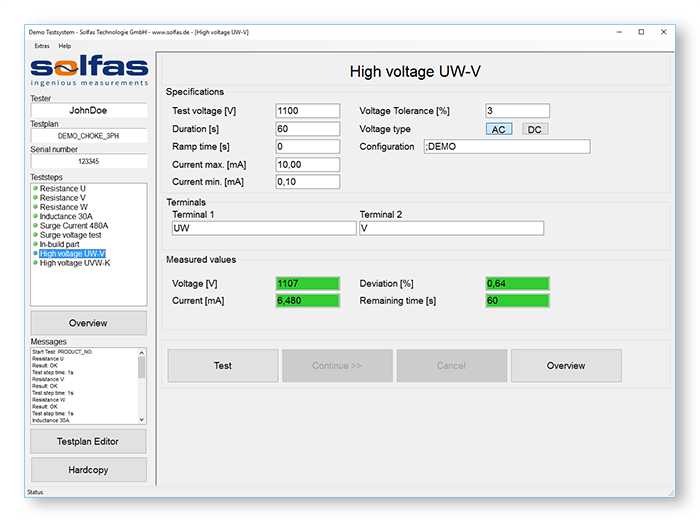 Solfas Test Suite supports different roles and access rules to coordinate test teams. 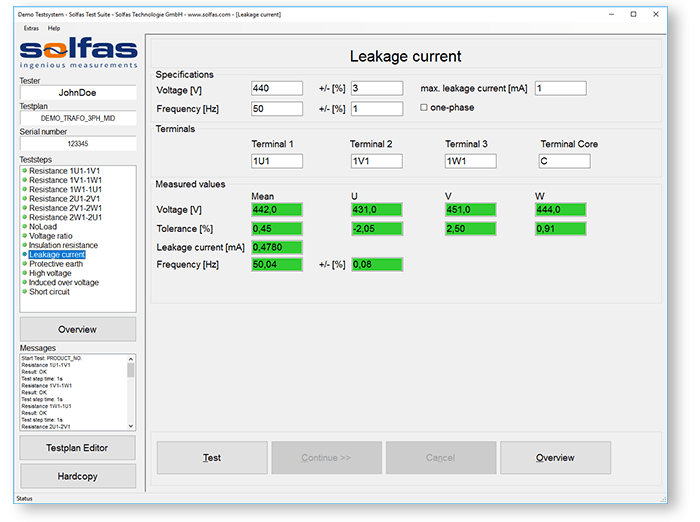 Development of test plans can be done by a qualified engineer while test operation is done by a technician without access to the test plan settings. 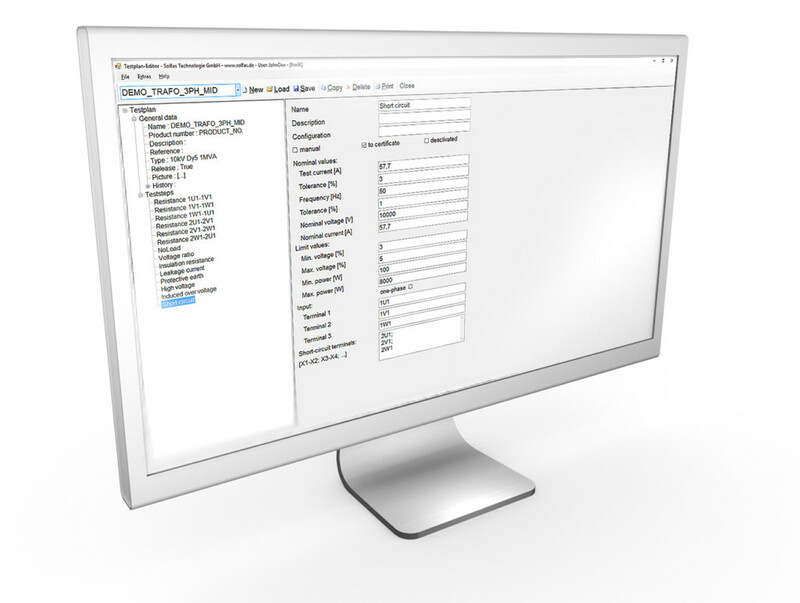 Create reusable and editable test plans with test step sequences and tolerances for each of your products. Scan item barcodes to capture items easily. 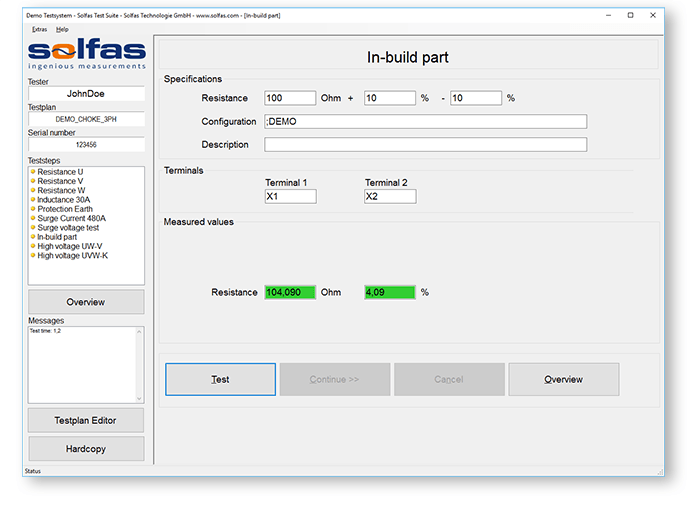 Solfas Test Suite supports standard barcodes and QR-codes. 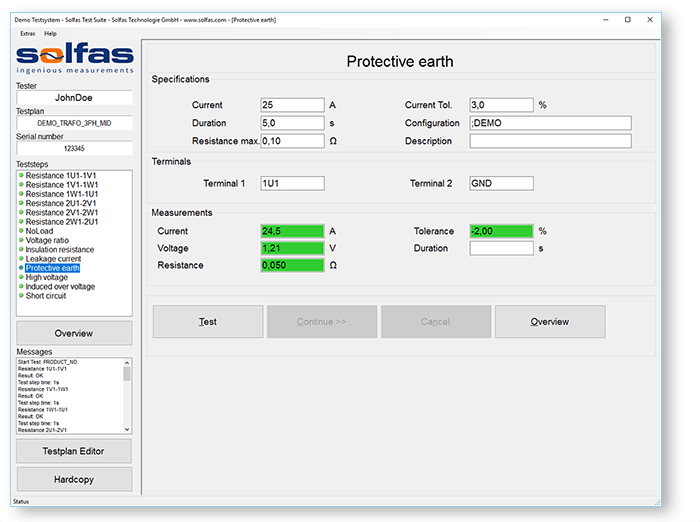 Solfas Test Suite stores data automatically by default. You can also write additional data manually into the result sets. Create comprehensive test certificates in pdf or export test results into xml, csv or json for analytics. 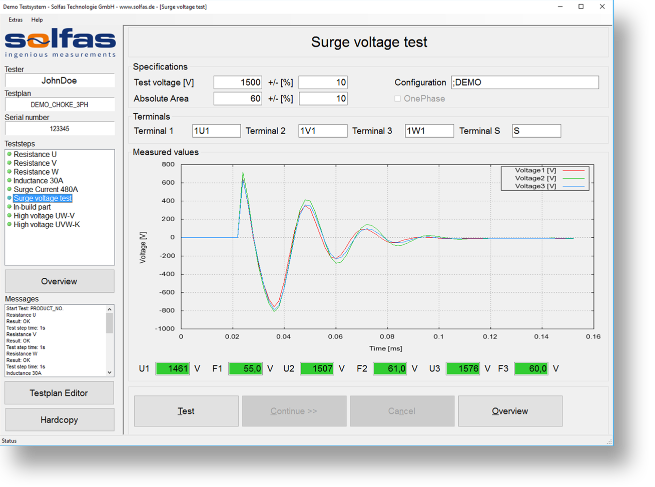 This test for power chokes is performed with sine voltage. Voltages, currents, power and frequency are measured and the inductance is calculated. 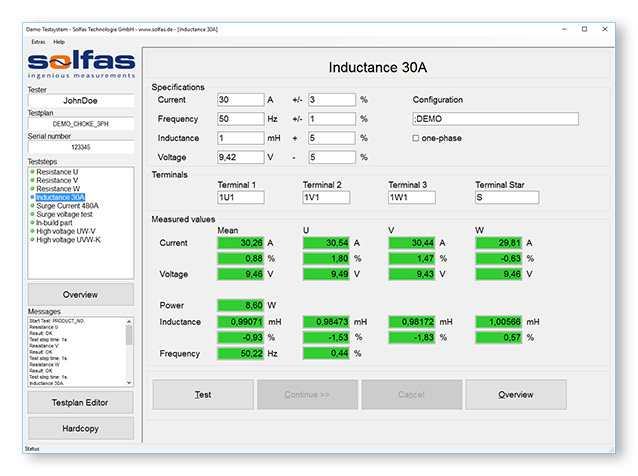 Besides the inductance characteristic against current the voltage and current against time will be displayed. Different filter options are available. This test for power transformers is performed with 50%-100% of rated current. Short circuit voltages, currents, power and frequency are measured. Several values are calculated and extrapolated to the rated data of the transformer. The induced overvoltage test of transformer is intended to check inter turn and line end insulation as well as main insulation to earth and between windings. In general it is done with 200% of the rated voltage and a frequency of more than 200% of the rated voltage. 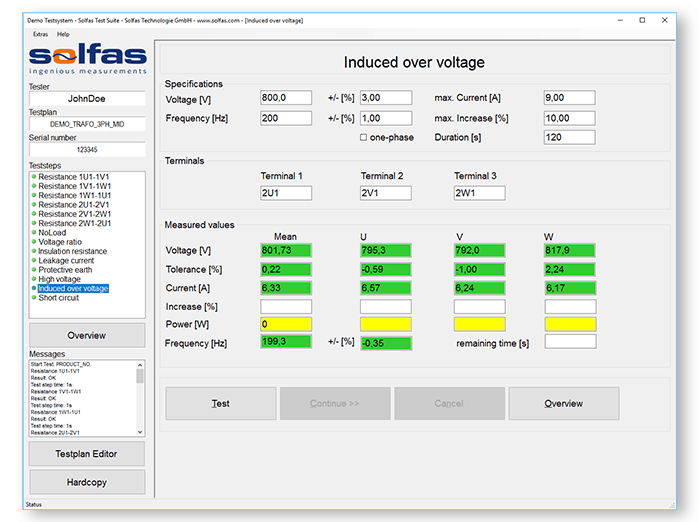 Voltages and currents are measured and monitored during the test duration. 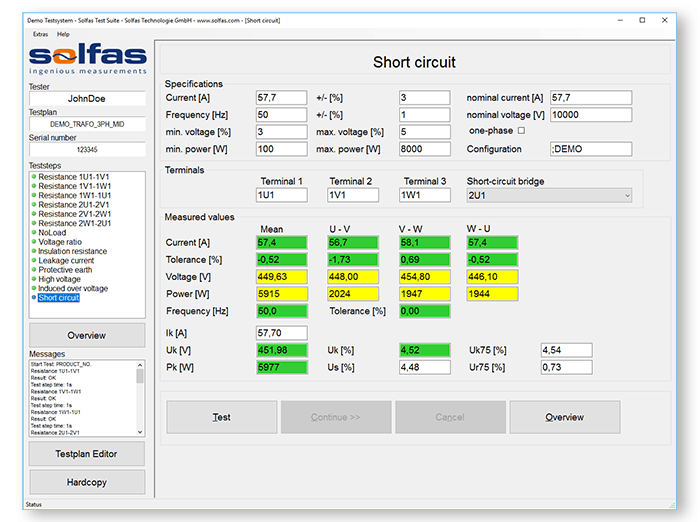 High voltage test is done full automatically. For the protection of the tester and specimen hi-pot test is done with over-current monitoring and break down. This test step done in 4-wire configuration. 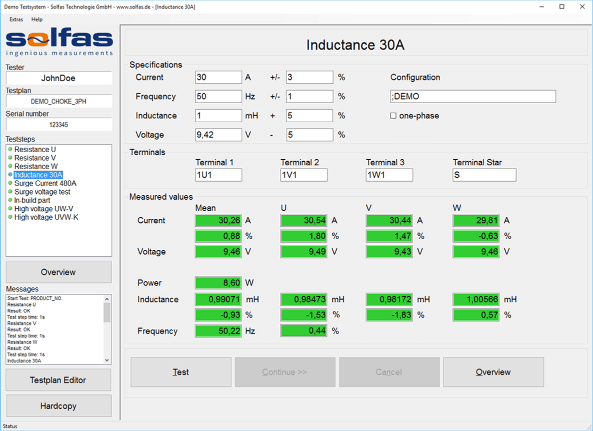 The test current can de adjusted according to test object requirements. 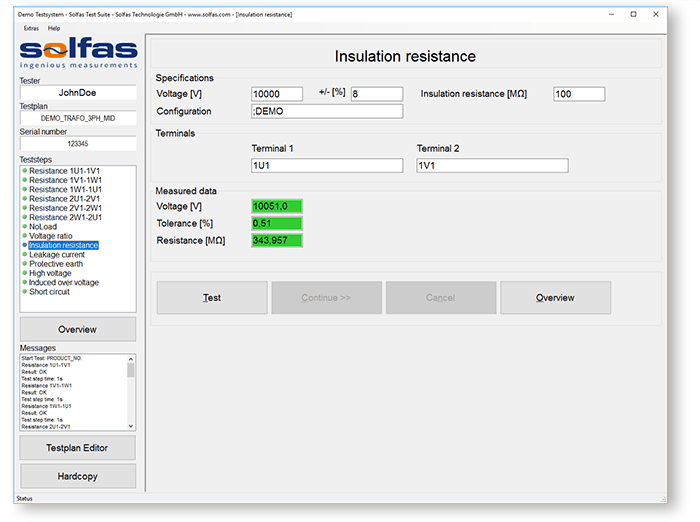 A temperature compensation of the measured winding resistances is performed. This test is used for detecting short circuits between windings or insulation problems inside one or multiple windings on wound materials. Courses of the 3 phases will be compared. 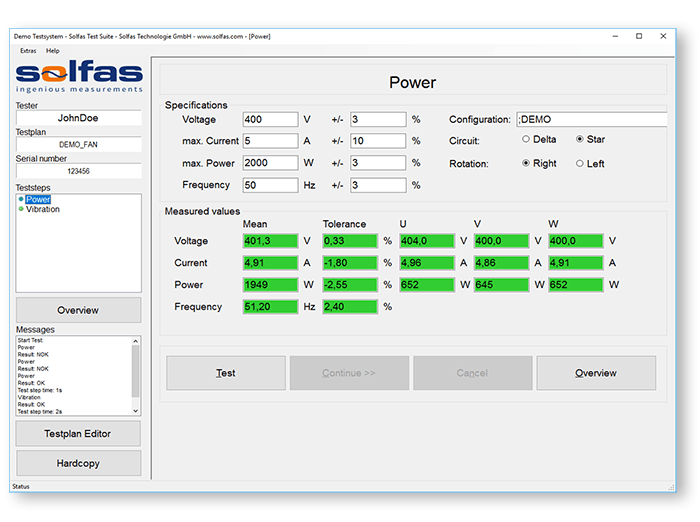 This teststep automatically controls hardware for star/delta and left/right direction settings and measures all power data. Oscillation test for fans can be done in multi-level system. 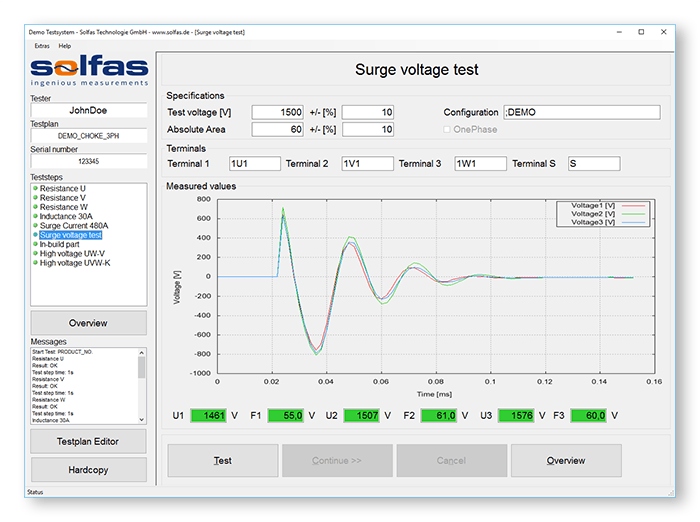 The software suite is ready for partial discharge tests according to IEC 60270 or IEC 60034. Predefined voltage curves from norm can be passed through. A specified PD limit prevents damage of testing object. 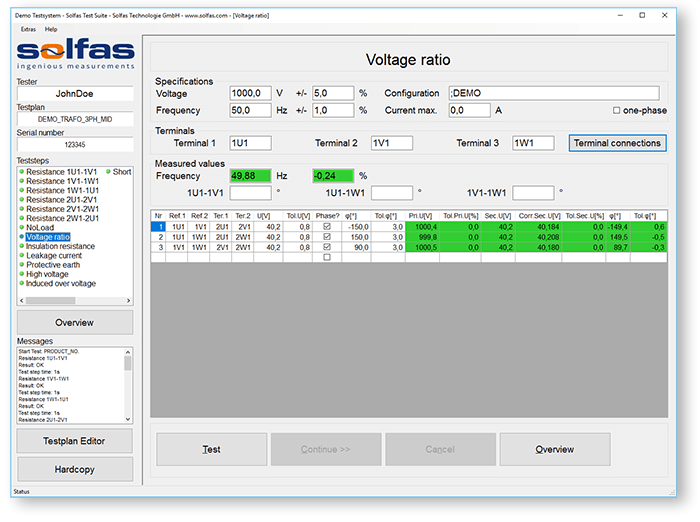 Each tapping can be measured and corrected to nominal primary voltages. Phase angular changes can be detected. 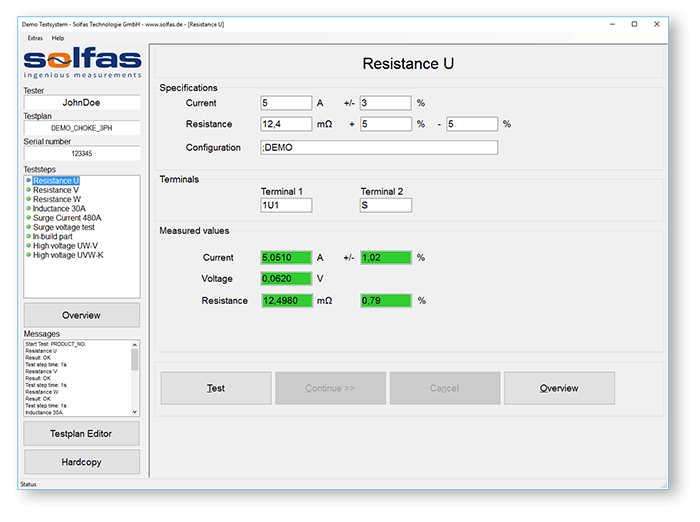 This teststep is optimised for measuring resistances of temperature sensors or other integrated parts. All data not mentioned in the other teststeps can be recorded here, no matter what. 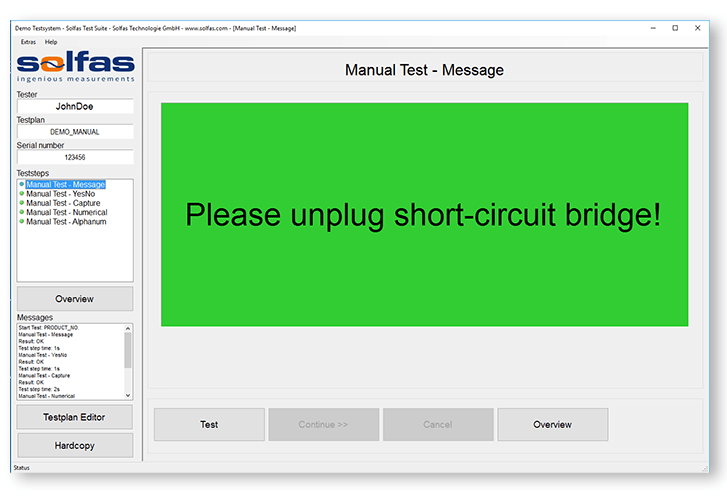 The software suite can handle message outputs, input of values or asking questions.